My son Robert and I passed through Kiowa County, Oklahoma on our way by car from Washington, DC to Colorado Springs in late May. We stopped to explore the country for a few hours, short to get a feel for the old home grounds of my Great Grandparents and their family. The ranches today are mostly in wheat, the late winter crop during our visit was mature and some farmers were harvesting. The land also supports cattle, some oil and gas is pumped from the shale deposits under the ranchland, and now, in places, there are clusters of enormous wind turbines. George B. “Doc” Mahaffie and Mary Frances Williams “Molly” Mahaffie, each at age 34, homesteaded in Oklahoma, at Kingfisher, just northwest of Oklahoma City. The Oklahoma Land Rush which started April 22, 1889, opened 2 million acres for homesteading, and 50,000 people lined up for the High Noon start. It was one of several openings and rushes in the late 1800s. As best we know, the Mahaffies were not “Sooners.” They waited for the proper time to move in and find a homestead. George and Mary had begun their family 300 miles away in Olathe, Kansas where George’s father, James Beatty Mahaffie, had built his farm and stage coach stop. In 1901, land further west that had been a Kiowa-Comanche-Apache reservation, in what become Kiowa County, opened to homesteaders. And the loss for Native Americans became the gain of thousands of homesteaders, including the Mahaffies. They moved one hundred miles further west and took claims at what became Komalty, Oklahoma. The county seat, Hobart, formed as a tent city with that 1901 land opening and before long the new homesteaders built the town. Both land rushes were part of a wave of late 1800s/turn-of-the-century land confiscations by the U.S. Government which took treaty-promised plans from native peoples. Oklahoma, which had been Indian territory, became far less in the control of Native peoples, though there are still reservations spread through the state. My grandfather, Charles D. Mahaffie, Sr., was about 4 years old when the Oklahoma land was opened to settlers. The family included his sister Rose who was 6. Their brothers George Barton “Bart”, and Oscar Beatty were not yet born, though Bart arrived that winter. Charles D. Senior was, if I recall right, with his father in a wagon for the Land Rush, and recalled hearing shots fired by homesteaders tussling over claims. 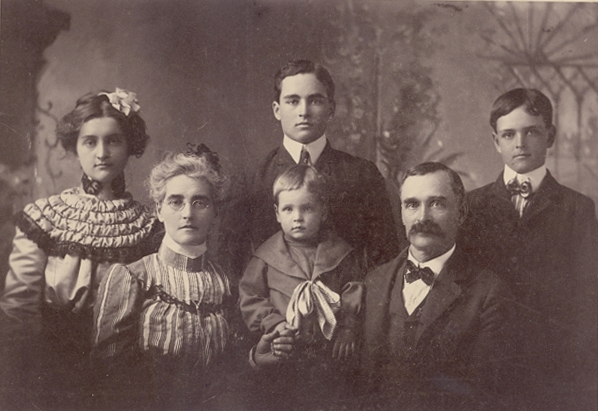 With each generation, the Mahaffies had homesteaded their way westward. Doc was born in Indiana, grew up in Olathe, Kansas where his father had settled. His father preceeding him was born in Pennsylvania and lived also in Indiana, before settling in Kansas. Picking up the pattern, Doc sought his fortune with his young family, further west, claiming his land in Kingfisher and then Kiowa County. The family prospered in Kiowas County, growing their holdings and becoming leading members of the community. Robert and I explored the fields and section roads around Komalty, where the Mahaffie homestead was. 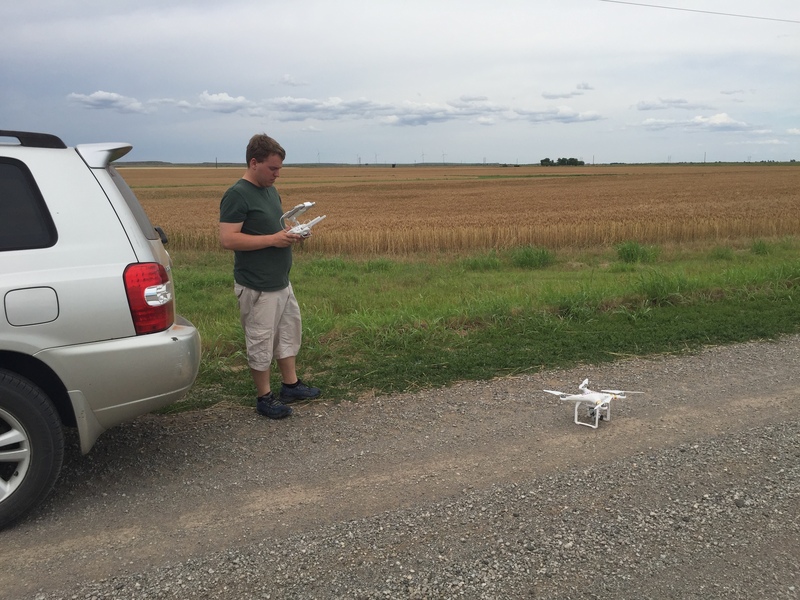 Robert flew his drone out over the wheat fields towards Rainy Mountain and took in the scenery. Komalty isn’t really a town now, if it ever was. The ranchers have assembled the old homesteads into larger parcels, and likely more often than not, they manage them from a home in town. Justin Krieger, who tenanted the land Charles D. Mahaffie, Jr. inherited and now owns it, lives in Hobart where he also has an insurance business on Main St. There are still scattered oil pumps in the Kiowa County fields, but there are also long arcs of wind turbines, adding power to the yield the area gets from wheat and cattle. Doc Mahaffie surely would have gone for turbines, anything to add to the productivity of his farm. In Hobart, “town” for the Mahaffies, we saw a worn-out downtown, and not much in the way of commerce or energy. It is a big town, the county seat. There are fewer people in the county now than there once were, it takes far fewer to farm and ranch. Hobart shows the signs of a smaller population. There were 27,500 in Kiowa County in 1910. Today about 9,300 people live there. A gravesite at Hobart Rose Cemetary has a Mahaffie headstone, and three small stones, for “Father” George, “Mother” Mary Mahaffie, and the youngest, which simply reads “Bart.” Bart is there because he died young, succumbing in 1919 to the influenza that killed millions. In his obituary, he is remembered as one of the favorite young men ever to live in Kiowa County. George and Mary’s children kept up the established pattern of moving onward to find their own way, but now higher education shaped their prospects. Charles had gotten all the way to Oxford as a Rhodes Scholar and initially moved westward to Portland, Oregon, before taking a job in Washington, DC with the Federal Government. Rose married and also moved west. Oscar completed college and also took a government job. And Bart had started his ranch in southeastern Colorado when he died of the flu. By the 1940s, no Mahaffie’s were left in Kiowa County, though Doc’s descendents still held land there until recently. Ranchers still thrive there, but much fewer in number. Very much appreciate your written contribution to early Kiowa County. My grandmother was born in Komalty in 1903. Though I live in the DFW area I have not yet had a chance to take my desired trip of exploration up to western Oklahoma. My family has also scattered and I have no current family connection there. The drone footage was particularly nice.